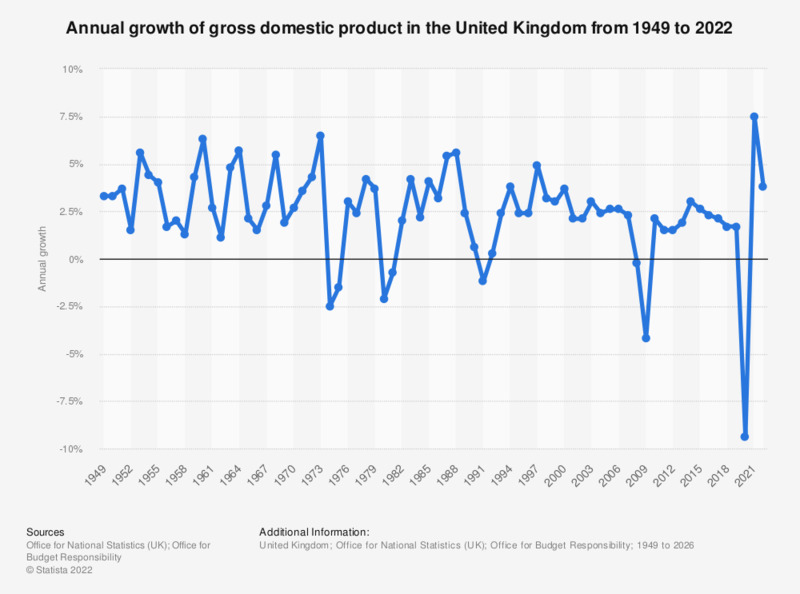 In 2018 the United Kingdom’s economy grew by approximately 1.4 percent, the slowest it had grown since the great recession of the late 2010s, where the economy shrank by 4.2 percent. Prior to the economic crash of 2008, the British economy expanded at a relatively healthy rate, particularly in 2000 when gross-domestic product grew by 3.7 percent. With a gross domestic product of approximately 2.11 trillion British pounds, the United Kingdom boasts the fifth-largest economy in the world. Within Europe, Britain’s economy is second only to Germany’s, while France’s economy is only slightly smaller than the United Kingdom’s. Until its trading relationship with the European Union is made clear, it is uncertain how Brexit will affect the economy of the United Kingdom. In the event of a no-deal Brexit for example the Bank of England predicted that GDP could shrink by as much as eight percent and lead to an increase in both the unemployment rate and inflation.